Our range of products include kitchen shelves and kitchen wardrobe. 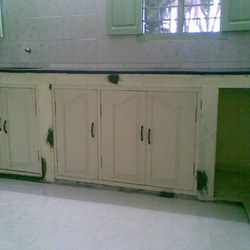 With long term industry experience, we are involved in manufacturing and supplying qualitative range of Kitchen Shelves. 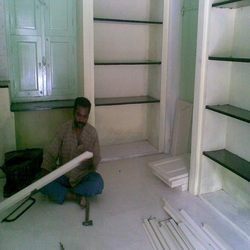 Our kitchen shelves are manufactured by using premium quality material & modern techniques as per with industry norms. The offered kitchen shelves are acclaimed among the customers for attractive designs and smooth finishing edges. These kitchen shelves are extensively used in kitchens of hotels and restaurants for keeping kitchen products. Backed by a team of experienced professionals, we are offering an extensive range of Kitchen Wardrobe. This kitchen wardrobe is designed in such a way that it offers ample of storage space and is most suitable for the kitchen area. Offered kitchen wardrobe gives an extraordinary look, style and elegance to the interiors of your house. This kitchen wardrobe is provided as per the divergent requirements of our clients at reasonable price within a given time frame. Looking for “Fibre Shelves & Wardrobe”?